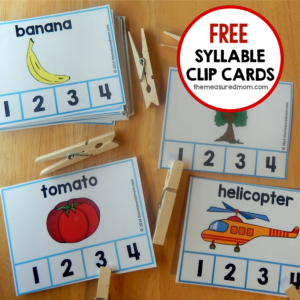 Today I want to share with you a fun syllables games based on the clipping cards shared by themeasuredmom site. To play this game put all the cards on the floor ,as unorganized and far apart as possible, faced up. 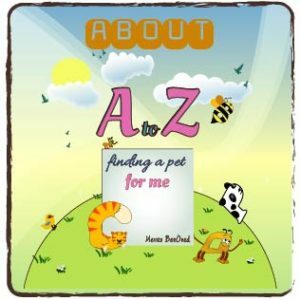 Ask the kids to pick up all the cards with a predefined syllables count. To play with one kid use a timer and have the kid try to collect the cards as fast as possible. For more then one child count how many right cards each child picked. For every wrong card one card is subtracted from the count. The kid with the most cards wins. To play this game put all the cards on the floor ,as unorganized and far apart as possible, faced up. Put music on. The kids need to move around the cards as long as the music plays. When the music stops you tell the kids what syllable count you are looking for and each kid need s to stand next to a card with that syllable count as quickly as possible. It has to be a card that no other child has chose to stand next to before him. If a child is standing next to a wrong card he is out of the game. Each round one card from each syllable count is omitted from the game. eventually there will not be enough card from the correct syllable count to stand one the kid left with no correct card to stand next to is out of the game.. kids to pick up all the cards with a predefined syllables count. The deck is divided evenly, with each player receiving half of the cards. Anyone may deal first. Each player places his stack of cards face down, in front of him. Each player turns up a card at the same time and the player with the higher syllable count card takes both cards and puts them, face down, on the bottom of his stack. If the cards are the same rank, it is War. Each player turns up 3 cards face down and one card face up. The player with the higher cards takes both piles. If the turned-up cards are again the same rank, each player places another 3 cards face down and turns another card face up. The player with the higher card takes all cards, and so on. The game ends when one player has won all the cards and wins the game. This is a little twist on the war cards game to make it a little bit more interesting. Instead of the one with the higher card taking the cards it’s the one who puts his hands on the higher card who takes the cards. This will keep all player alert as the fastest player take it all. This game is for advanced students.